8” foot circumference and 9 1/2” long from back of heel to tip of toe. To fit women’s U.S. shoe size 8. 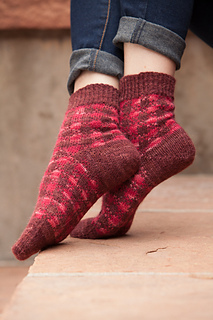 The Alpaca Road Socks feature a solid-colored toe and heel and a plaid pattern at the leg and foot that owes its gently faded look to tone-on-tone colors. Finished Size 8” foot circumference and 9½“ long from back of heel to tip of toe. To fit women’s U.S. shoe size 8. Yarn Classic Elite Yarns Alpaca Sox Solids (60% alpaca, 20% merino wool, 20% nylon; 450 yd [411 m]/3½ oz 100 g): #1827 bordeaux (MC) and #1825 rose (CC), 1 hank each. Needles Sizes 1 (2.25 mm) and 2 (2.75 mm). Adjust needle size if necessary to obtain the correct gauge. Gauge 32 sts and 34 rnds = 4” in Plaid patt on larger needles.